Fledgling ideas spark to life, formless and nameless, yet compelling and enrapturing, as you sense the closeness of a new beginning, quietly forming, waiting patiently for you to listen. These filamentous orbs of light illuminate the emptiness, a void you have been unwilling to leave, as the seduction of the familiar binds you fast. Yet those sparks grow ever brighter, slowly washing out the grey as the spring dawns, hOpe returning as your courage grows in the light. 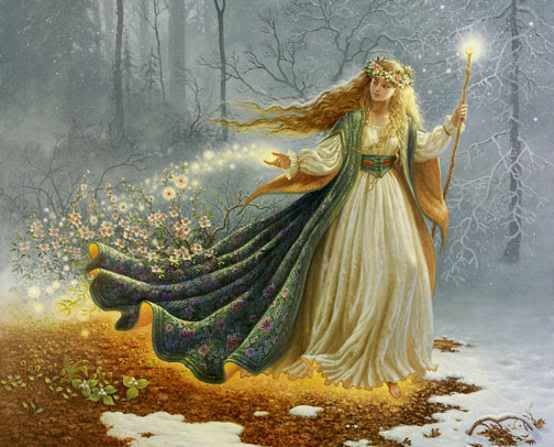 Within that light, She emerges, whispering visions in your dreams, lifting the caul from your eyes and removing your hands from your ears, as she sings a song of plenty, awakening your spirit to adventure. The way ahead may not be fully clear, in this burgeoning light, but you can trust the promise of this dawn, for soon enough the way will be shown. For now, listen to Bríg and the vision she has planted in your dreams.